Who doesn’t love macaroni and cheese? It’s definitely a favorite of mine and one of my favorite comfort foods. This stovetop mac and cheese is wonderful. The macaroni is cooked in milk, which makes it creamy and easy; and the combination of cheese is salty, creamy, melty deliciousness. I’m getting cravings just writing this! One pot makes clean-up easy, what more could you ask for from your favorite comfort food? Place pasta in a colander and rinse with water. In a large saucepan, add pasta, milk, butter, mustard powder, salt, and nutmeg. Over medium heat, slowly bring the milk to a simmer, stirring frequently. Once the mixture comes to a simmer, quickly turn the heat down to low. 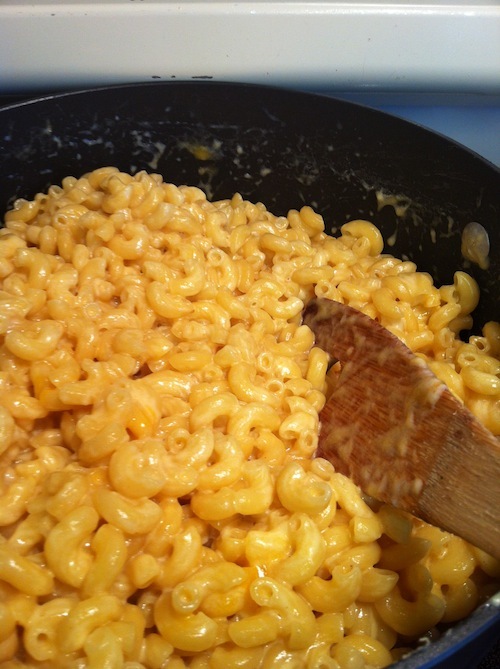 Let macaroni slowly cook in the milk stirring constantly. After about 15 minutes, or once the milk has mostly been absorbed and pasta is cooked, add the shredded cheese and mix well. Turn off the heat, cover with a lid and let sit for about 5 minutes to allow the macaroni to finish absorbing the last of the milk. Taste, adjust seasoning as needed, and serve immediately.